Clean and cut all vegetables into finger length pieces. Chop the onions cut the tomatoes into quarter pieces. Soak tamarind in warm water for a few minutes. Now extract a bowl full of tamarind juice and discard the pulp. Cook red grams in a pressure cooker with enough water, salt and a pinch of turmeric powder. Keep it aside. Heat oil in a pan and fry split grams, coriander seeds and red chillies in oil and grind them smoothly along with grated coconut and water. Mix this paste with the cooked red gram. Cook all the vegetables by adding enough turmeric powder and salt. Mix the tamarind juice and red gram mixture with the cooked vegetables. Allow it to boil till the aroma comes. Heat oil in a pan and pop the mustard seeds. Then add the fenugreek seeds, asafoetida and chopped onions and let it sauté for a while. Pour this mixture over the sambar and add chopped coriander leaves and stir well. 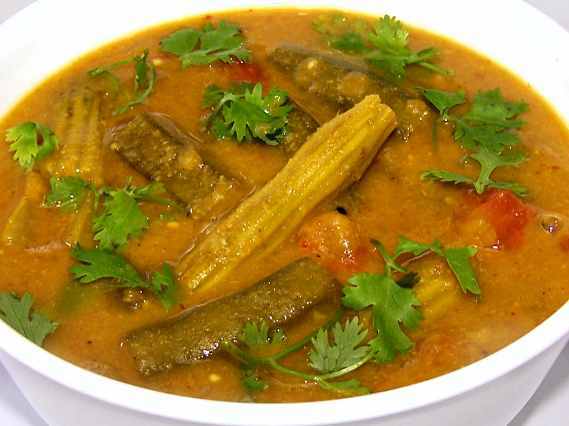 Sambar is now ready to serve with rice.